11 Benefits Of Books | Why Is Reading Important? 11 Benefits Of Reading Books | Why It’s Important To Read Everyday? Books are everywhere. Libraries big and small and bookstores are splattered all over college campuses and larger cities. They are all filled with one of the most important things of all time—books. Those who read books appreciate the multiple places to find books. Those who aren’t fans of books, don’t understand what could make readers want to obsess over books. There is a reason for their obsession, though. You hear it all the time: read every day. Though reading might seem like simple fun, it can be helping your body and mind without you even realising what is happening. What makes reading so important? It can be for these reasons and not just knowledge. For those who don’t enjoy it, you might change your mind after hearing about the benefits. Can something so easy and fun be so helpful in your life? Of course, it can! Reading can be a great benefit to you in many different ways—such as sharpening your mind, imagination, and writing skills. With so many advantages, it should be an everyday occurrence to read at least a little something. Reading is important because it develops our thoughts, gives us endless knowledge and lessons while keeping our minds active. The importance of a book to help us learn and understand cannot be underestimated. In the world today where information are abundant, reading is one of the best ways to be informed accurately. Books can hold and keep all kinds of information, stories, thoughts and feelings unlike anything else in this world. Can words, paragraphs, and fictional worlds be all that great for you and your health? It definitely can, and it is a timeless form of entertainment and information. In fact, for years reading was the only form of personal entertainment, and perhaps this is why it has been in the spotlight for such a long time. Reading has survived the years, and luckily, the benefits have survived right along with the books. So let’s talk about some reasons why reading is so important. The benefits range from improving mental health, to improving physical health, to creating healthy habits, and it’s no wonder that books and reading are so high up on the list of personal entertainment. Though books have been around for an incredibly long time, they have not lost their importance throughout the years. Below are a few of the fantastic benefits of picking up a good book and immersing yourself in words. Check out our review and get a special discount as well! Reading is great fun for many people, but it also has many benefits for your mental health in the form of thinking and understanding. By concentrating on the words and the storyline, it stimulates your brain and cognitive functions. This particular stimulation can help sharpen your mind, especially the part of the brain that is responsible for concentration and critical analysis. It sharpens this part of the brain much like you would sharpen a knife. This sharpening of the mind will eventually heighten your focus when concentrating on something important. Reading doesn’t just help with your critical thinking, but it also improves your brain function. Consider what happens when you work a muscle every day. That muscle grows and becomes much stronger than before. Reading works much the same way for your mind. The constant stimulation of the brain that a book provides is similar to the exercise required to work a muscle; it strengthens the separate parts of the brain that control your thinking and analysing skills. When reading, you might come across a few words you don’t quite understand or even recognise. This confusion can lead you to look up the word and discover the definition. Dictionaries, both in physical form or ebook form, can be beneficial to your understanding this new word you might not recognise. Because you didn’t know the word, to begin with, the act of searching for the definition helps your brain retain that new and exciting word. Consider how far your vocabulary has come since you first learned to read. You now know many new words that are more intelligent sounding than when you first started the habit. What does this do to benefit you? Well, after several days of reading and looking up new words you don’t understand, your vocabulary will begin to expand one word at a time. Words and phrases, if you read every day, fill your brain with a new vocabulary that you might never have learned without reading. This is proven in this study by the University Of Oregon. Often, you might not even realise how much your vocabulary has increased after even just one day of heavy reading. These words that you have been learning will begin to integrate themselves into your everyday vocabulary, and you will start to catch yourself using these words. It is incredible how much you take in while reading, and this aspect of understanding is another significant benefit of a daily habit. 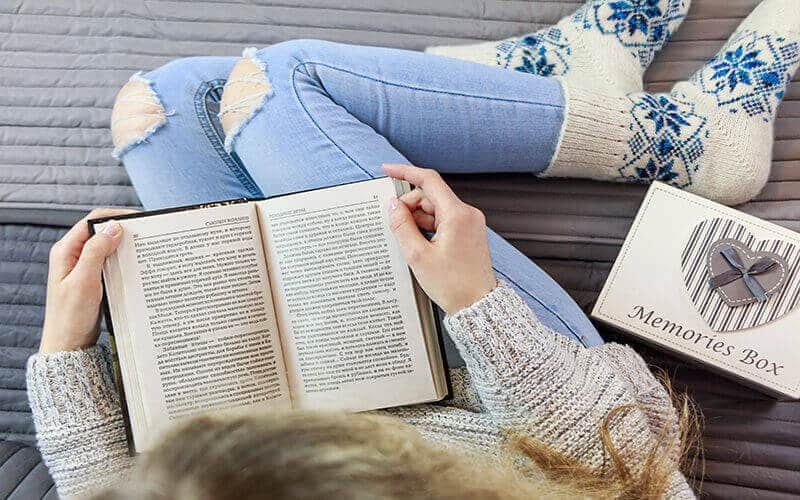 Most people know from experience that reading is a great form of entertainment, but what you and those other people might not realise is that reading can help lower stress levels. You read that little fact right, though it seems strange to say. The very act of it and focusing on the written word can help relieve your mind of anxiety and the pressures of the day. By pulling your mind away from the stress at hand, you can relax and let the stress melt away. It sounds almost too good to be true, but how does reading decrease stress? Well, your brain immediately transports itself to a different world with different people. This change in pace can be a breath of fresh air for someone who is stressed out or suffers from extended periods of stress. By doing this, you can allow yourself to take a breath, relax, and be swept away to another world through the words written on the page. Stress can affect many parts of your daily life, and after long periods of intense stress, it can even be harmful to your overall health. Both novels, and other literature can help solve the issues that stress causes by allowing your mind and body to relax. Once you start, you will start to focus, not on your stress, but on the words and storyline. In time, reading will lower your stress level, making you feel better mentally and physically. Reading, especially self-help books, can help ward off depressive occurrences. Just like with lowering your stress levels, it stimulates the part of the brain that deals with depression as well. Self-help books, full of information about how to better yourself and your state of mind, can help ease depression. Reading books can be extremely beneficial for someone who might suffer from depressive tendencies but not enough to need medication. Decreasing depression might seem like an odd benefit, but the stimulation of the brain is extremely helpful when it comes to easing something of this nature. The feeling of happiness that also comes from stories can brighten your mood, helping your day turn from sad to happy. Of course, it is not a permanent fix for a serious problem, but it can help ease the difficulties of depression. Consuming literature works much like a pain reliever might relieve joint pain. Though it has been mentioned earlier about how reading can improve concentration and critical thinking, there is another part of mental health that it helps to improve. This point is stated by NCU on their blog. Reading at least a little each day can improve your focus and your memory function. In this instance as well, it stimulates the brain, particularly the part of the brain that helps with memory and attention. Just like with physical exercise, it is a form of mental exercise that pushes your memory and focus to the limits. Simple comprehension improves your memory function. Remember the tests in elementary school where you were tested to see how much you retained while reading those short stories. Well, the comprehension as an adult works the same way. While reading, your brain is constantly retaining pieces of information about the story. Because the part of the brain that controls memory is stimulated, it acts like exercise for this part of the brain, resulting in improved memory. How does your focus improve? Your focus is strengthened because it requires focus to read. When sitting down to read a book or article, you will not understand what you are reading unless you’re focused. Consider what it is like when doing a math problem. To get it correct, you have to focus intently on that problem. The same goes for reading. Again, like the memory function in your brain, your focus is exercised, which helps to improve your overall focus. Reading doesn’t just have health benefits; it has benefits for other aspects of your life as well. These advantages help to make readers well-rounded individuals. Those who write, know the importance of reading. Whether you write things for work or just for fun, heavy reading can improve your writing skills and abilities. There are several ways in which it can help strengthen your writing skills, and each of these ways happens without you even realising it. To improve and make writing online easier, check out our Grammarly review. Although the enhancement of your imagination is not one of the more common benefits, reading can significantly increase your imagination. Consider the worlds that you are immersed to and the characters you come across while going through a novel. Because of these worlds and characters, the part of your brain which houses your imagination is stimulated, causing you to imagine what the places and people look like just by picturing the words. Did you know that reading can also help with your sleep? No, this doesn’t mean that it helps you fall asleep, but it does contribute to improving your overall sleep pattern and restfulness. Reading, since it enables you to relax and de-stress, can help pull you into a deep and peaceful sleep. That sounds like it might be too good to be true, but reading can, in fact, help you sleep. Reading before bed calms your body and mind, especially after a long and stressful day. Even if it is just a short amount—a chapter or two—the peacefulness that reading induces can help slip you into a deep and restful sleep. The relaxation that books can bring is just one of the wonderful benefits of reading every night before bed. Perhaps the most well-known benefit of reading is the entertainment value of opening a book with crisp, white pages. Of course, the entertainment is typically what draws avid readers to pick up the next great book. In fact, it has been a solid form of entertainment for many years. Though reading is perfect for entertainment, there’s more to it than just the entertainment factor. Any reader knows that going through a book can be peaceful and induce a relaxing state of mind. By immersing yourself in a good book, you can almost feel any stress or worry melt away. You are both entertained and relaxed just by reading, which is just one of the many great things about books. With the ability to entertain and induce peacefulness, reading has been a constant comfort to people of all ages and from all walks of life. For years, this entertainment factor has been at the forefront of literature. Books and other forms of writing are still just as popular today. The peaceful state of reading has been just an amazing as the entertainment. Many great readers and writers have mentioned the importance of reading throughout their careers, being advocates. Books allow you to see things from a completely different perspective. Reading about a certain culture, for example, can help you to understand how that culture differs from your own. You might not agree with that culture’s perspective, but at least you’ll look at things from a new angle. Books give you new ideas. You’re constantly learning when you’re reading, and you can start to look at the world from a more balanced perspective. In the absence of other viewpoints, we tend to have a very one-dimensional type of thinking based on our upbringing. We act the way we do because that’s what we learned during our formative years. We look at things from the angle of our own experience. Using this lens, it is easy to assume that our way is the correct way. Books can help us see things in a new light, allowing us to let go of the notions of “correct” or “incorrect” and seeing instead different ways of being human. Take, for example, the image of a Muslim woman wearing a burka or hijab. A lot of people in Western society may view this as a type of oppression. In reality, however, many Muslim women choose to dress in this manner as a part of their spiritual beliefs. If you were to read a book or article on the matter written by a Muslim woman, you could learn to start seeing things from her perspective. It’s a big world out there, and reading is one way to expand your mind to all the possibilities. So take this challenge and start reading just one book today! If this post was helpful, do share! 11 Benefits Of Reading Books | Why It's Important To Read Everyday? Books are everywhere. Libraries big and small and bookstores are splattered all over college campuses and larger cities. They are all filled with one of the most important things of all time—books. Those who read books appreciate the multiple places to find books. It was nice to know that reading can help you to learn new things constantly. As you said, this will help you to have a more balanced perspective. With that in mind, I’ll look for self-help websites that can help me to become independent. My goal is to become a self-reliant person because I always want to do things on my own. This is because I believe that I have skills that I can use at any type of task. I used to read a lot but I got too busy with different things. This made me realize that I should read again to reduce stress and enjoy my alone time.